Which style? If you don't own a pair of UGG boots already, get the Classic Tall boots. Why? Because they are classic (ha!) and most importantly, they'll keep you very warm. Which color? You can't go wrong with the sand color. It is a neutral and goes with everything (even with your Louis Vuitton purse!). Yes, it'll get dirty; oh well! I also like the chocolate color; I saw a couple of ladies wearing chocolate UGG boots lately and I was tempted to get them too. But one pair is more than enough for now. Maybe next year! What size? Ah, the size! This was quite a challenge to decide which size to get. The fact is this Classic Tall UGG boots stretch A LOT. I usually am a size 8.5, and one of my girlfriends told me I should get a size 7. Another friend who usually is a size 7, got a size 5 and mentioned that although it was a little tight at the beginning, it did fit perfectly after wearing them a couple of times. Aaaaaaaaah! So I ordered size 6 and 7; and after many many tries, I decided to go with size 6. So go for at least one size smaller than you usually wear. Where to order? I love the UGG Australia official website. I got free shipping and the boots were beautifully wrapped. How to wear them? 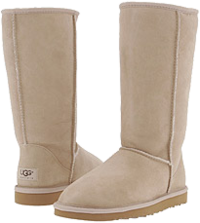 I love wearing my UGG boots with a capri jeans (and Citizens of Humanity capri jeans are the best!). There is not need to try to fit the jeans in the boots and it won't get bulky at the knees either. So perfect! Feel free to add your thoughts, tips and feedback on how to shop for UGG boots and how to wear them. The more the merrier!